Imagine a physical display of Nelson Mandela’s cell the same dimension as his cell in Robben Island; alongside it several photographic displays and three screens showing the cultural platform which takes the form of the plan of Robben Island. This serious game allows you to enter Mandela’s Cell and hear his story, walking down the corridor you encounter a map – as you click on the map pins a cultural event across the EU and SA spring to life. 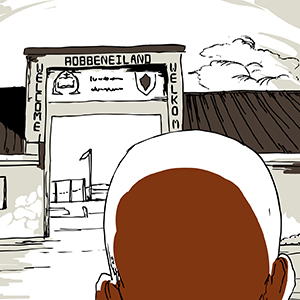 As you go outside to the prison yard you can play the serious game – a dark graphic novel about his time at Robben Island. A lecture series and teacher notes will be produced. It will be displayed in UK, South Africa, Sweden and Belgium. In addition, the eCulture platform has a global reach and will be live 3 years after the end of the project. Mandela 27 opens to the public at The Herbert Art Gallery & Museum, on Friday 11th April. It is a truly exciting and extensive piece of research that will soon be brought to life. “It has been an amazing first year of the Mandela27 project. We have achieved a lot, the timeline is almost complete, the game is part finished and the exhibition is featuring in the stylish and popular BELvue museum in Belgium. We all learned about the struggle Mandela and the other freedom fighters went through to free South Africa from apartheid when we held our second project meeting at Cape Town. At the Mayibuye Archive we were moved and saddened by the censored letters home by the prisoners, and stories of separated families, too many to mention. But we were also cheered by the stories of courageous individuals in UK and Sweden who went to extraordinary lengths to assist the South African freedom fighters. The project team stayed on Robben Island for our second team meeting, it was an unforgettable experience. We left Cape Town on the boat in dusk, the lights of the harbour twinkling behind us and the boat gently rising and falling with the swell. When we arrived at Robben Island it was dark and we had some small sense of what it must have been like for the political prisoners arriving in the dark to that bleak and windy island, but they would have been cold and hungry and chained. Standing in the lime quarry on Robben Island looking at the blinding white rocks where the political prisoners spent most of their days breaking rocks surrounded by guards and dogs I was shocked and very emotional as the voices of the ex-political prisoners (who now share their experiences with visitors) resonated in my mind and I knew that this really did happen. The island was beautiful and bleak and had that air of lost opportunity and despair. The experience gave all of the project team that extra incentive to make sure that our project is successful. What struck me most during the development of the Timeline part of the project this last year were the similarities in struggles across Europe and South Africa during Nelson Mandela’s incarceration, particularly in the UK where the Irish “troubles” were still fresh in my memory. “Solidarity” was also prominent in Poland where the workers struggled for freedom and the Singing Revolution in Estonia, Latvia and Lithuania where national songs were forbidden during the years of soviet occupation made a big impression on me. I am constantly amazed at how the human spirit reacts to oppression and refuses to be beaten. The project team have unearthed many localised but relatively unknown events of “culture influencing democratic change” across Europe and I can’t wait until we show them to the world. More information on Mandela 27, including a cultural timeline, is available at mandela27.eu. 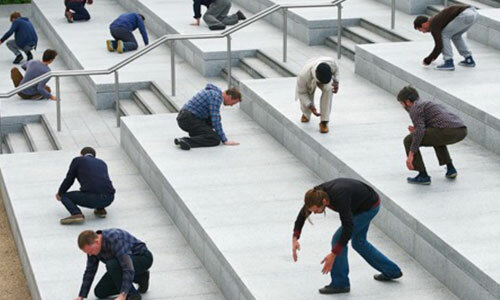 Please don’t forget to visit the project at The Herbert Art Gallery & Museum, from Friday 11th April.